The Fairest Run of All: Squirtgun To Your Head: Favorite WDW Store? JENN: Squirtgun to Your Head time! What's your favorite store at Walt Disney World? Betcha it's the same as mine! I wonder if anyone reading this is thinking, "Yeah, me too." We don't even have to say it. JENN: Well, I'm going to anyway, because it's fun to say. MITSUKOSHI DEPARTMENT STORE! The magnificent fiscal sinkhole center of the Japan pavilion at Epcot. MOON: Where you can find anything with a cat on it. My cat Hoodoo gets a different kitty dish every morning. JENN: The kitchenware section is indeed AMAZING. MOON: Yes, and let's not revisit that story again. JENN: I have a plate that says "Hustle Cat." The dog was "Lucky Dog," the bear was "Happy Bear," and the cat... is a hustler. I love it. At the back of that section they also have a little sake bar, which I have patronized once or twice but not explored NEARLY thoroughly enough for my liking. MOON: I don't know if I'm just too conditioned to go straight for cat merchandise when I enter the store, but I don't remember you ever mentioning a sake bar. But I know you. You would have. JENN: It's past the huge displays of gummy candy shaped like random stuff. I think I was with Elizabeth when I got a drink there. MOON: Well, I would say that we should drink our way to Japan next time, but we know I won't make it past Mexico. JENN: Ha, sure we will. We'll just share and go slow next time. Mitsukoshi is also a great place to get gifts for anyone who likes anime or Hello Kitty, who is a particular favorite of my mother. 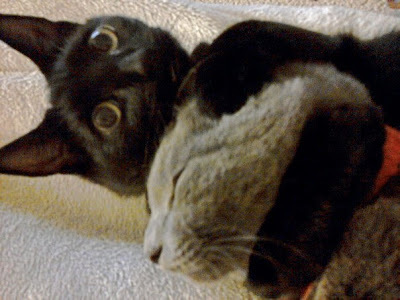 I once bought her a Hello Kitty robe for Christmas. We are disinclined to completely grow up in my family. MOON: Who doesn't adore Hello Kitty? 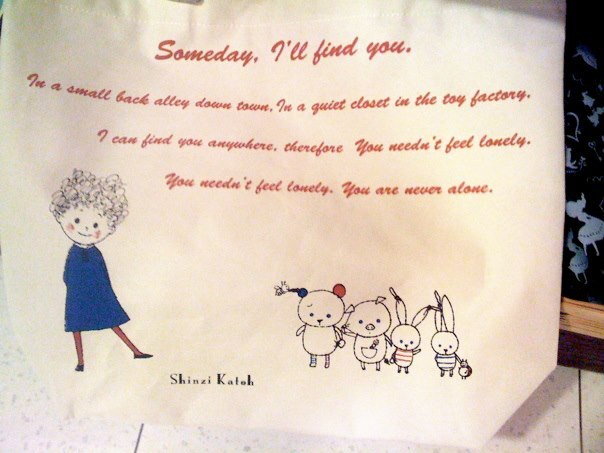 Everyone should have a Hello Kitty something. JENN: There's also a room full of beautiful dresses I can't afford and incense with such wonderful smells that I once bought some as a wedding gift for a friend; the next time I went down to WDW, he gave me some money and told me to buy as much incense as the amount could get. The Shinzi Katoh stuff is ADORABLE - funny and/or touching, oddly-worded-through-translation English phrases accompanied by the cutest illustrations, printed on bags and cards and notebooks and things. JENN: I totally bought this. I mean, I had to. 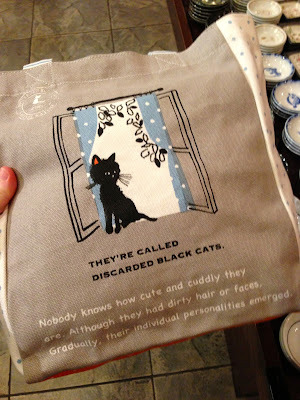 I have an adopted black cat and a sense of narrative. JENN: I find this strangely poignant. My mom is named Sheri and she loves cats; there are a few designs with a girl and her kitties labeled "Chéri with cats." That's like half my Christmas shopping DONE right there. MOON: Jenn has stories to tell. 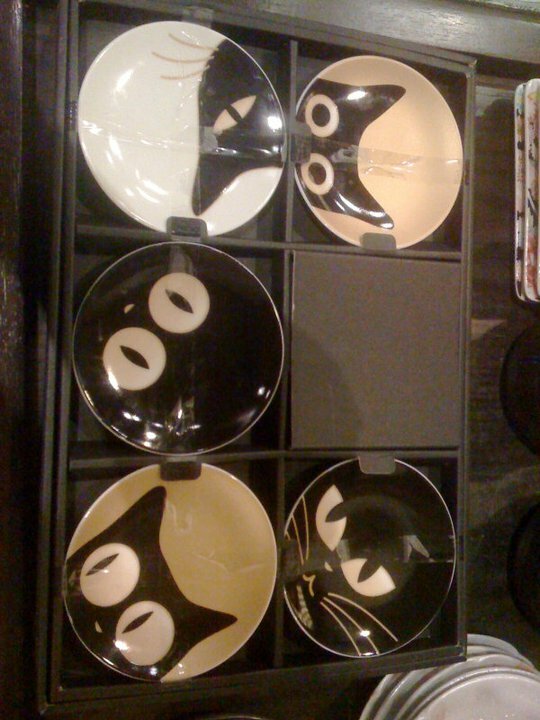 I just have about 20 cat dishes in my kitchen. JENN: Just cats? No bunnies or owls? Bunnies and owls have been big lately. OH! That reminds me of another story. 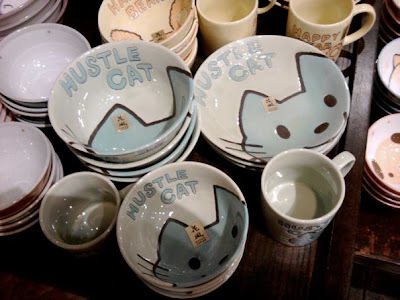 I once bought a mug there because the cats on it reminded me of my cat Minx. the same as these plates. You see what I'm saying. And then someone at my old job STOLE IT. 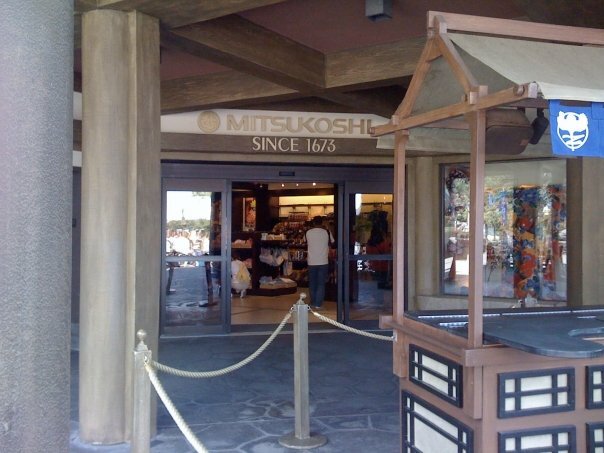 So keep a close watch on your Mitsukoshi souvenirs! They are irresistible enough to drive people to crime! MOON: You should have stolen all the other cups and left a note. "The cups will be returned if the cat the returned to ME." JENN: Well, I handed in my two weeks' noticed shortly after. REVENGE. MOON: Hahaha, that works also. I would have taken all the other cups with me when I left. JENN: I think my ultimate point is that I could easily empty my bank account at Mitsukoshi. Or redecorate my house, restock my kitchen cabinets, and revamp my wardrobe, should I ever win the lottery. Stupid rent payments, ruining my aesthetic aspirations. MOON: Well, I suppose you need a place to put all the stuff, so rent is merely an extension of Mitsukoshi. JENN: Ha! I'll remind myself of that next time I pay. 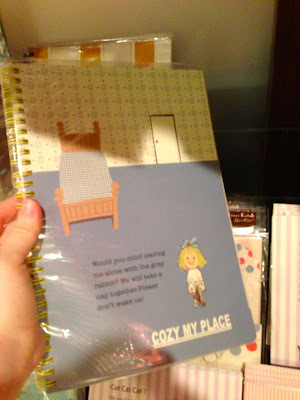 What's your favorite WDW store? Do you love Mitsukoshi too?! the Japan pavilion is my favorite place in all of Epcot. I could sit there forever and eat the Flower and Garden frushi and now I need a hustle cat dish.